The C40B Basket-Weave Sand Chair has a reclined seating position and legs that offer stability in the sand. The C40B Basket-Weave Sand Chair is features a powder-coated aluminum frame and double-wrapped vinyl straps that are available in a variety of custom color combinations. The C40B Basket-Weave Sand Chair comes with a commercial warranty and is great for the beach or around the pool! 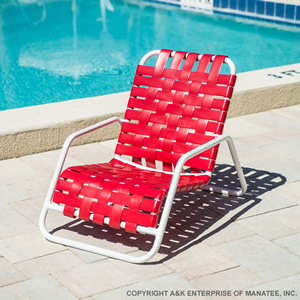 A&K Enterprise of Manatee, Inc.